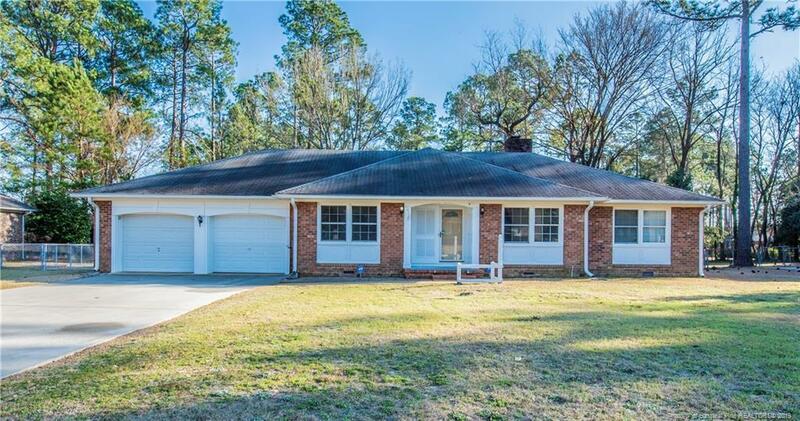 Over 2,000 sqft 3 bed/2 bath, very well-maintained brick, ranch style (one level) home with a two car garage, just 5 minutes to Fort Bragg! Interior living space features: Formal Living Room, Formal Dining Room, Den with a Fireplace, Eat-in Kitchen, 3 Bedrooms, 2 Bathrooms plus a Laundry Room. Hardwood flooring throughout the formals and bedrooms. Vinyl Windows. The lot is spacious and level, fenced in the back, and, the shed stays! This lovely home also has a HUGE deck with Sunsetter awning and bench seating. Gutters are installed all the way around the house. Water heater pump pushes hot water to the other side of the house for instant hot water in the bathrooms. This is a great home with A LOT for the money, in a beautiful setting and will not last long. You don't want to miss this one!